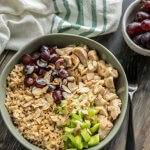 This healthy chicken salad brown rice bowl is easy and a great well balanced meal you can prep ahead of time! I am so excited to bring this recipe to you today! I love the Chicken Salad and Brown Rice Bowl from T. Loft so I had to recreate it at home and share it with you! So, while this recipe was inspired by T. Loft, I knew I could make it at home and customize it to the perfect recipe to share for anyone who is wanting a super easy recipe that is perfect for meal prep! My favorite thing about this salad is that it is completely customizable. You can add as much or as little as you want of every ingredient based on your dietary wants/needs. I am sharing what I prepared for myself, but feel free to play around with it a bit! This recipe is perfect because everyone can customize it. It includes protein, carbs, fruit, vegetable and fat… so you are going to be fueled with a healthy meal! You can make it in under 20 minutes! Since it’s customizable you can make as much as you need for however many meals you want to prepare. Did I say it’s delicious, yet?!? Having a meal ready to go in the fridge is always helpful for me and makes healthier choices easier to make. Since I am home with my kids, I like when I can make a meal and have leftovers, or have something quick and easy for me to make for lunch. If you stay home do you like to have your meals planned out, or are you more of a “fly by the seat of your pants” kind of gal? 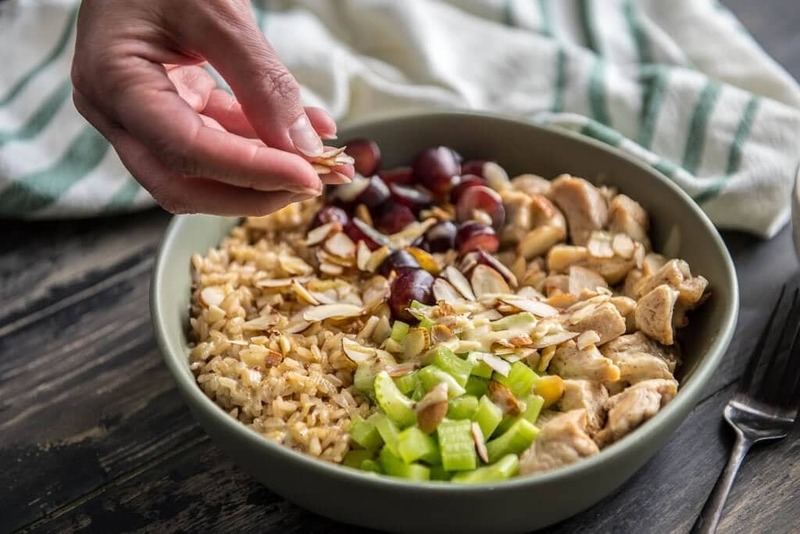 I really hope you love this Healthy Chicken Salad Brown Rice Bowl. If you do, please share it with your friends on Pinterest here! 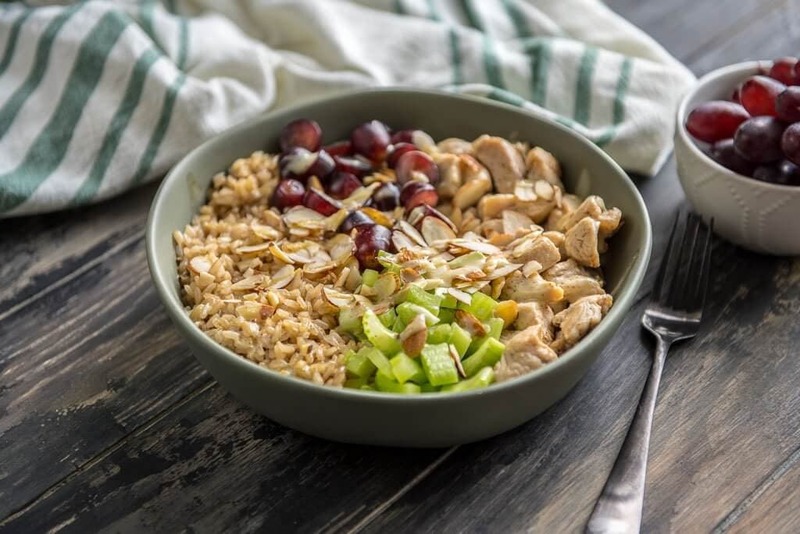 A delicious and fresh chicken salad bowl over brown rice that is a great meal prep recipe! Heat oil in pan and add diced chicken. Sprinkle celery salt on chicken and cook until done. While chicken is cooking, prepare brown rice according to package. Once rice is done, divide into 4 bowls, placing 1/2 cup in each bowl. Divide cooked chicken into 4 bowls. 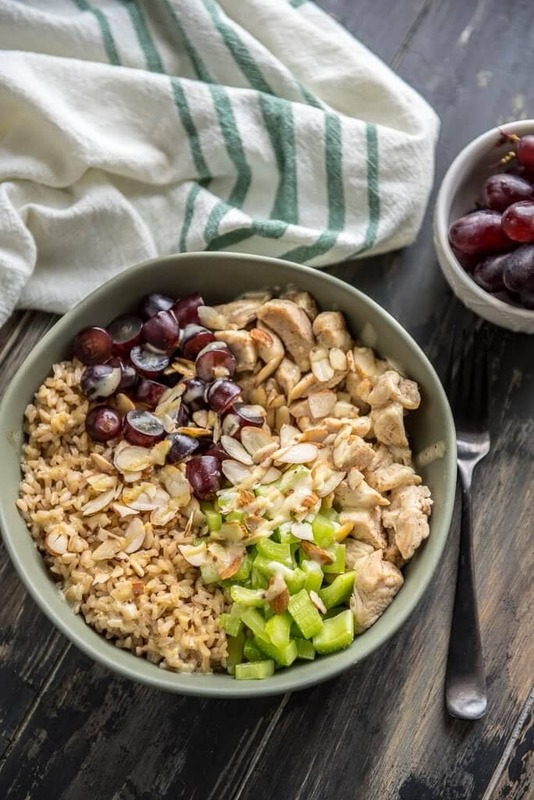 Divide grapes and celery into 4 bowls. Sprinkle 1 tablespoon almonds over each bowl. Drizzle 1 tablespoon Bolthouse Farms Honey Mustard over each bowl. You can also elect to add dressing right before you eat it and skip this step during preparation. Chicken salad was delicious !!!! I’m so glad you enjoyed it, Debbie! Just finished meal prepping this for my lunch this week! Looks and smells delicious! Hope you love it, Caroline! 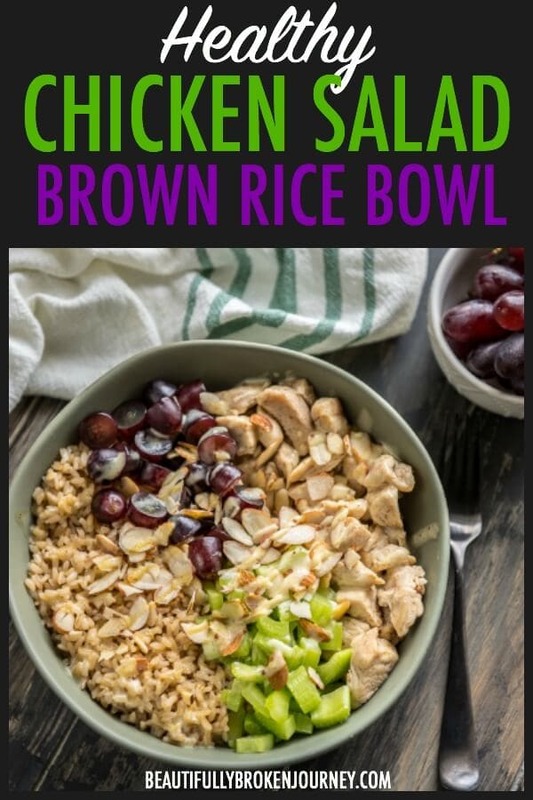 This sounds so light and delicious, love that you’ve added grapes sounds so yummy! Yum!! I’m loving salads with lots of filling toppings like this. Perfect for hot summer days! This sounds do good, healthy, and it’s something that I don’t have to heat. I love this! So simple and so delicious, perfect packed lunch fodder that… Love it!!! I gotta start meal prepping, so glad I come across this recipe. It seems so easy and such a quick prep time.